For the first time in a decade Time magazine has dispensed with any coverlines, although the startling image probably needs no explanation. 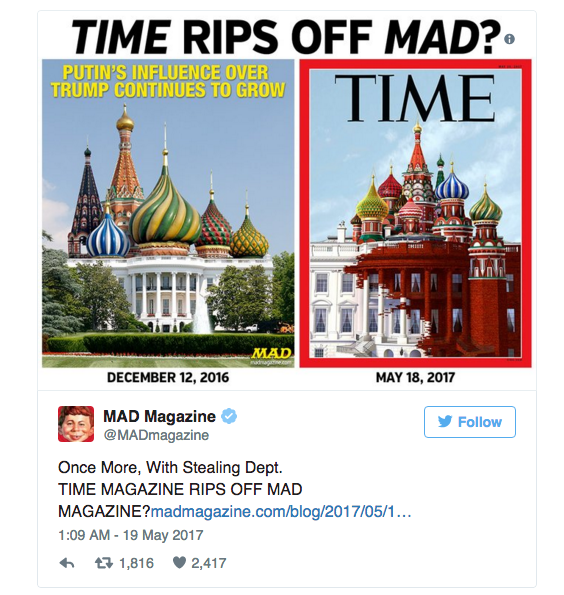 In a testament to the power of print, the magazine’s cover shows the White House morphing into the Kremlin – a clear attack on allegations that President Trump has sidled-up with the Russians and adds to the further speculation Moscow was somehow behind Trump’s election win. The cover comes only days after the President sacked FBI Director James Comey and revelations Trump revealed highly classified information (believed to have come from Israel and regarding apparent bombs on planes concealed in laptops) to the Russian foreign minister, Sergey Lavrov, when he was in the Oval Office. In turn, Trump has called the allegations the “single greatest witch hunt” in US political history. 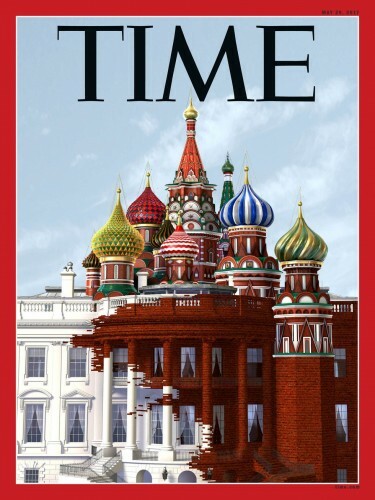 The President is yet to comment on the new Time cover.